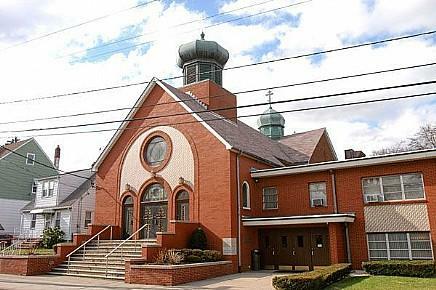 We are a community of Orthodox Christians in the community of Clifton, New Jersey. We are part of the Diocese of New York and New Jersey of The Orthodox Church In America. Jesus said "Go into all the world and preach the Gospel to the whole creation" (Mark 16:15). We exist to proclaim Christ's Good News in our small part of the world, both repeatedly to ourselves and to those around us. and through service to others, both in our local community and in the world-wide community. The Church in the Bible. The Orthodox Church goes back to our Lord Jesus Christ, His Apostles and the first Christians. When we read of the Church in the Scriptures, we know that we are part of that same Church. The Church of the Bible. Jesus Christ, our teacher, is the Word of God (John 1:1). We listen to, live by and learn from His words, from the teachings of His apostles and prophets, and from the record of God's people in the Scriptures. A Church of Tradition. We inherit our belief and practice from the early days of the Church and from the Church throughout history. Saints defended this faith and martyrs died for it. We continue this faith and practice in our present day and age. A Church of History. Since our church goes back to the first century, our rich history reflects that. The Orthodox Church is not a newcomer to America, either. It first arrived in Alaska in 1794 and has been in New Jersey since the 1800's. Our community in Clifton was founded in 1935. A Church of the Cross. Crosses are everywhere in our church, from the large crosses on our roof to the small crosses we wear around our neck. These are all reminders that "we preach Christ crucified" (1 Corinthians 1:23). Christ gave us a new commandment, "that you love one another; even as I have loved you" (John 13:34). His love for us was expressed by dying on the cross. This self-sacrificing love is what we strive to have and share with the world. A Church of the Resurrection. "If Christ has not been raised, then our preaching is in vain and your faith is in vain" (1 Corinthians 15:14). We frequently say "Christ is risen! Truly, He is risen!" and we mean it. Every Sunday is the Lord's Day, when we celebrate the Resurrection and experience the Risen Lord. Our annual celebration of the Resurrection on Easter is truly a sight to behold! A Liturgical Church. "Liturgy" means "common work of the people" and our worship is truly the work of God's people. Our forms of worship go back centuries; they unite us to our past, are relevent today as ever, and move us toward the Lord's coming. A Sacramental Church. God acts in our lives. The Sacraments bring God's sanctification to our entire life. A Eucharistic/Thankful Church. As Christians, we always thank God for everything He has given us, both known and unknown. Our central act of worship, celebrated every Sunday, is known as the Eucharist, Greek for thanksgiving. In this, we partake of the Body and Blood of Jesus Christ. "For as often as you eat this bread and drink the cup, you proclaim the Lord's death until he comes" (1 Corinthians 11:26). A Praying Church. We take the apostle Paul's directive "pray constantly" (1 Thessalonians 5:17) to heart. We have several services each week. In everything we do, we pray and ask God's blessing. A Church of Sinners. This may come as a shock to some, but "all have sinned and fall short of the glory of God" (Romans 3:23). Jesus had fellowship with sinners and said that "those who are well have no need of a physician, but those who are sick; I came not to call the righteous, but sinners" (Mark 2:17). Therefore, our church is a community of sinners. We often stumble, sin and fall short of what God expects, even as a community. Each of us struggles with this sinfulness and tries, with God's help, to repent, get up and try our best to walk in communion with God. A Church of Diversity. God "desires all to be saved and to come to the knowledge of the truth" (1 Timothy 2:4). Our community is formed of people young and old, single and married, from many walks of life and occupations, and from all parts of the globe. Some were raised as Orthodox Christians and others became Orthodox later in life. Embracing these differences, we are united by our common faith in God. A Church of Healing. We all have wounds and scars from life's journey. The church is a spiritual hospital where we meet our Divine Physician, Jesus Christ. A Sensory Church. God created the whole person, so our worship of God engages the whole person and all the senses. The sight, sound, taste, touch and smell of our liturgy involves the believer and brings us into an awareness of God's presence. An Active Church. Our holistic approach to worship extends to all parts of our church's life. Activities and opportunities for fellowship and fun are part of what we do as a congregation. Small... In A Good Way! We are not a large community. We are definately not a "mega-church." Right now, we number around one hundred people. We try and foster a friendly, family-like quality in our church. We do not want anyone to get lost in the crowd! A Friendly Church. The Apostle Paul said, "Do not neglect to show hospitality to strangers, for thereby some have entertained angels unawares" (Hebrews 13:2). We welcome each and every person who comes into our midst, invite them to fellowship and serve them to the best of our ability. 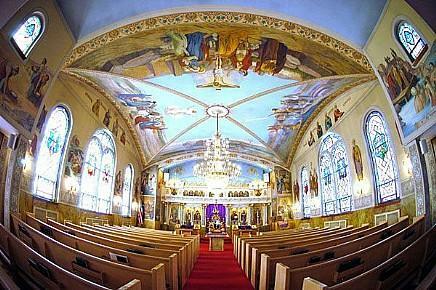 This section is courtesy of Holy Trinity Orthodox Church-Stroudsburg, PA.